Diego Simeone’s Atlético Madrid are arguably the form team in the world currently. After overcoming Barcelona over two legs, they were faced with a worse-performing Bayern Munich in the semi-finals. Hosting the first leg, Cholo’s men made yet another great defensive performance to keep Bayern goalless after Saul Niguez opened the scoring early with an excellent solo run and finish. Although Pep is known for his variability in how he sets his team out, Bayern were organised in a rather orthodox 4-1-2-3 shape. The most surprising feature was his omission of Thomas Müller who found himself stuck on the bench to start the game. Still without the presence of Boateng, a centre-back pairing of David Alaba and Javi Martinez was used behind Xabi Alonso. Simeone, with his much more consistent selection opted for a fairly standard side in his usual 4-4-2 shape. Diego Godin was suffering a hamstring injury thus Savic took his place alongside Gimenez in the heart of the defence. Facing up against the best defensive team in recent history, a large proportion of the build-up to the game was how Bayern would approach it in possession of the ball. Few teams possess the ability to break down Simeone’s immaculately-organised 4-4-2(-0) shape but Bayern have the potential to fall into that category. Yet for large parts of the game, their possession game was distinctly weak with little presence in key attacking areas. One of Guardiola’s biggest questions coming into the game was how he was going to overcome Atlético’s high-press, which Simeone has previously employed in the opening stages of big games against Barcelona. When his team were looking to bring the ball out of defence, both full-backs maintained deeper positions in the structure whilst the width was instead provided by Coman and Costa higher up. This has been something practiced quite commonly by the Catalan manager, with Lahm in particular able to provide an important influence in the deeper spaces during the development of possession. During build-up, both full-backs maintained quite deep positions. Against Atlético, this unorthodox full-back orientation seemed to be in an attempt to find stability against the above-mentioned Atlético press. Occupying deeper positions on the pitch, Bernat and Lahm could theoretically help stabilise their build-up phase through their presence in deeper zones closer to the centre-backs. They could form stronger connections to the defenders and potentially help overload the 1st and 2nd lines of players, giving Bayern a greater capacity to progress the ball through the midfield. Lahm’s role was particularly interesting from a tactical perspective. The German full-back had a quite-clearly different orientation to that of his teammate on the opposite flank as he commonly moved into narrow positions during the first 10 minutes of the game. In a number of cases, his inside movement led to him forming a double pivot with Alonso in the second line of players. From this position, he generally looked to find passing lanes between Griezmann and Torres, suggesting it was done to perhaps break Atléti’s press in the more strategically-favourable central zones. Atlético adapted quite well though and the two forwards were generally able to cover this adjustment by the opposition, as Lahm moved to a more standard role after the first 10 minutes. Lahm situationally moved into midfield on a few occasions at the beginning of the game. Another potential aim of these deep full-backs was to open the wing spaces where they could possibly progress the ball forward. With the full-backs deep, there was potential to drag the Atléti winger out of position and whilst the Atléti full-back was man-marking the winger, open space between on the touchline. This was done recently by Barcelona to mixed success but against such a pressing machine as Atlético, building through the centre is often out of the question entirely. Through the deep positioning of the full-backs, there was some potential to open the wide spaces between the full-back and winger. Vidal receives the ball in a very poor position, making it difficult to progress the ball past this area. There are a few issues with this tactic to progress the ball upfield however. Most importantly, the recieving midfielder is immediately challenged as he is moving towards the touchline in order to receive the ball. Not only is he moving into a weak position with limited space available to utilise, but he has his back to the entire pitch and with pressure in the form of an aggressive Atléti midfielder behind him, he is rarely able to turn to then face the rest of the pitch. This tactic to weaken Atlético’s press wasn’t as effective as Guardiola would’ve hoped. The deep positioning of the full-backs gave them situationally-limited space against the oppositional pressure as they were closed down near the touchline quite often. Cruyff himself once stated that full-backs should be avoided in build-up, given their weak position to move the ball forward. Yet with Bernat and Lahm as close options, both saw a lot of the ball when Bayern were trying to bring the ball upfield. They were also hampered by the weak positional play of the midfielders, with both Alonso and Vidal frequently taking up ill-suited positions which disrupted their build-up more than supported it. Both commonly moved into positions close to the ball-carrier, immediately limiting his space whilst making the defensive line simply overcrowded considering the presence of the full-backs. With not enough space occupied by too many players in Bayern’s first line, their construction of possession was distinctly limited. Considering that Atlético’s dominant control of the centre is extremely difficult to overcome, it was of little surprise to see Bayern take on a more wing-focused possession game. After around the 15th minute of the game, both Thiago and Vidal began increasingly-focused on moving into wide positions near the touchline, where they could form micro-structures with their respective teammates in the full-back and winger positions. In doing so Bayern had the intentions of developing the possession through wider areas, looking to bypass their opposition’s defence by playing around it. Atlético’s midfield is open as they try to press Thiago wide, yet the pressure is sufficient to stop Bayern from taking advantage. The effect of the widely-positioned central midfielders was clear to see. In the respect of Bayern, their ball circulation was made in a ‘U’ shape from flank to flank where they were focused on playing through. The triad of wide players on either touchline was an attempt to create small structures to play through in these areas, yet Atléti’s excellent shifts made this difficult to be truly effective. As for Atlético, it had an impact on their defensive structure with the central midfielder often moving out to track the movement of that of Thiago or Vidal. The centre did momentarily become open during these scenes yet the strong pressure on the ball meant that Bayern were largely unable to exploit this. The man-oriented tracking of the central midfielder meant that the Bayern player couldn’t turn and his options on the ball were thus limited. With both 8s more focused on occupying the flanks instead of the centre, Bayern’s presence through the middle of the pitch was frequently lacking. During possession in the midfield areas, it was relatively common to see just the ball-far central midfielder and the inverted full-back taking up positions in the middle of the pitch. In other cases there was even fewer players. Without a sufficient number of players through the middle, Bayern’s possession game suffered considerably. The attacks down the wide areas were often isolated, with little means of moving the ball inside whilst play through the middle to begin with was near-impossible during many scenes. Guardiola himself was once quoted as saying “in order to attack well through the centre you need players who are open wide and to attack well through the flanks you need to play well in the central areas”. You need sufficient occupation of the central areas of the pitch in order to be effective closer to the touchline yet in Wednesday night’s game, the centre of the pitch was open in many instances. Criticism of Guardiola could’ve also been made when the starting lineups were announced too. His dropping of Thomas Müller, a player famed for his ability to find space where no-one else can with his offensive movement was particularly difficult to understand. When you’re facing a team away who exert an unparalleled amount of defensive control over the key spaces on the pitch, Müller would be the first name on many starting lineups as unlocking that space is often the key. For all the criticism of Bayern’s play in possession, heaps of praise must be again due to Simeone’s side, who made yet another world class defensive performance. When Bayern did manage to get the ball inside, it wasn’t for long against the intense pressure of Atlético. As ever, they began the game in their 4-4-2 shape organised with high levels of compactness, even when pressing high into Bayern’s half. When defending their own third, the home side would efficiently shift into a deeper 4-4-2-0 structure as both Torres and Griezmann protected the centre in what becomes effectively a 6-man midfield. With this shape high in vertical and diagonal compactness, the home side protect the central spaces with utmost coverage. To reduce them to simply 3 lines of players would be a total discredit too, with the team staggered expertly in order to maximise cover of the midfield spaces. Whilst pressing in higher positions, it was common to see Gabi take up a much more advanced position than Fernandez whilst the positioning of the two wide midfielders are often asymmetrical. The ball-far winger always takes up positions in the centre of the pitch and can offer to cover the ball-far central midfielder whilst the ball-near winger supports the pressure in areas much closer to the ball. Atlético use a more man-oriented approach when pressing higher. The structure of the press is often variable as a result of the man-orientations which Atléti use commonly to gain access to the ball. Whilst the opposition are bringing the ball out of defence the Rojiblanco players will cover the nearby passing options in order to restrict access, then moving up to apply further pressure on the ball. This was again on show against Bayern during the moments when Atléti wanted to press into the final third, which were albeit perhaps less frequent than their defensive displays in the quarter-final. It’s very difficult to argue that Atlético aren’t the best defensive team in the world. Their organisation is second-to-none and it’s rare to see open spaces within the tightly-knit block. An important factor in maintaining this level of defence is their ball-oriented shifts against the opposition’s circulation. In reaction to the opposition’s passing, the collective block moves extremely effectively to adjust to the change in ball position with each individual knowing how they should move and what position they should adopt to best defend the situation. A gif from @analysport’s Atléti analysis, click the image to open it in a new tab. One of the most impressive components with their shifts is their accuracy in doing so. In correspondence to nearly every pass, they adjust immediately and display a strong positional and structural intelligence to change their shape to better defend the new situation. The two strikers share the coverage of the 6 space effectively and switch this responsibility with greater efficiency with these shifts. In deeper positions, the midfielders move horizontally with well to follow switches and will move up to cover spaces when necessary, as shown in the movement of the LCM in the above gif. Whilst shifting to maintain defensive stability, Atlético also have a great understanding of and reaction to pressing triggers which they can use when they want to take a more aggressive approach in their defensive game. If there are any deficiencies in the pass then the team moves up quickly to increase their access as they try to force a turnover or at least a back-pass. These strong shifts allow Atlético to maintain defensive access against the opposition’s ball movement, which is often made to reduce the defensive pressure in the first place. Even against fast and effective ball circulation, Simeone’s side can usually keep up and maintain good distances to the ball at all times and stop the opposition from opening gaps. Through these shifts, Atléti are also well-equipped to defend against Guardiola’s playing philosophy. As noted in numerous analysis, one of the manager’s main ideas of attacking is to create overloads on one side and then to open the space by switching quickly to the underloaded opposite side. In doing so, they look to open spaces by moving the ball quickly before their opposition can adjust and thus find gaps in the process to then penetrate the defensive block. However when coming up against Atlético, this strategy is faced with a team who can adjust to these switches better than anyone. 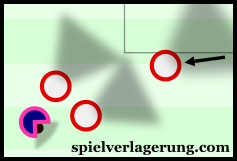 The man-marking ball-far full-back makes isolations difficult to create whilst the ball-far winger covers the half-space well in order to reduce Bayern’s ability to open the gaps. As a block, they then shift with pinpoint accuracy and great intensity to quickly recover access to stop the opposition from progressing the ball into any dangerous situations. One of the most intriguing components of Simeone’s defensive scheme is the orientation of both full-backs. Whilst the rest of the team defend much more zonally as they aim to exert maximal control over the centre of the pitch, the full-backs are distinctly much more focused on covering their man. Often seemingly without regard for other reference points, both Juanfran and Filipe mark their respective opposition wingers and frequently stay tight to them, even when the ball is at a significant distance away. Juanfran stays close to Costa, whilst Saul covers the channel between. Through this orientation, the Atlético full-backs intend to restrict the opposition’s ability to generate effective 1v1 situations. This is achieved through the close marking of the full-back which immediately makes it difficult to make a pass into the winger. Both Luis and Juanfran have developed strong anticipatory skills and the Bayern wingers’ attempts to create space for themselves by feigning runs in behind or deeper rarely came to fruition. When a pass is made to the wide player, the close marking from the full-back impacts how the winger can actually receive the ball. With the full-back goal-side and close-by, it’s rarely possible for him to receive the ball facing goal which immediately puts him at a disadvantage as he must turn to get into an attacking body-shape. Furthermore, it is also difficult to receive the ball with any momentum and the static body position makes it difficult to make dynamic dribbling actions to win the 1v1 too. Atlético shifted very well to defend this isolation moments. Furthermore, both Atlético full-backs are excellent in defending dribbling in isolation situations. Both have very quick feet which is an important tool to defend dribbles with a high touch-frequency whilst their tackling in these moments is not only brilliantly-composed but is a great example of controlled aggression too. They were both supported very well by the adaptive shifts of their teammates too, who quickly moved over to offer their valuable support. The ball-near winger shifts across quickly to help double-team the winger and cover diagonal passing lanes inside. The ball-near winger immediately moved from covering the half-space vertically to support the pressure with the full-back. The two of them together covered the passing angles diagonally back into the centre and stopped the winger from making the through-ball into his full-back inside. Alternatively, his options immediately become rather limited, as he is now faced with dribbling two strong defenders or making an unlikely through-ball. He’s often limited to playing the ball backwards to where it came and the ‘U’ circulation is resumed. Whilst the winger moves across to support, the near-sided central midfielder will drop in to cover the half-space which he left and situationally track the full-back if needed. The ball-near centre-back shifts quickly too in order to block the spaces where the full-back is looking to expose and collectively they defuse the situation well. In reaction to the pass to the winger, Atlético’s ball-oriented shift works effectively for them to regain local compactness around the ball and defensive stability is maintained. One of the disadvantages of this aspect is the gaps which appear due to the disconnect between the full-back and his centre-back. With the full-back focused on covering the winger, there are often quite large gaps which appear in and around the half-space as the rest of the defence are based much more centrally. Although the midfield stagger themselves well in order to cover these gaps as well they could, they weren’t as impervious in these areas in comparison to the centre of their block. This could be considered one of the very few open spaces within Atlético’s structure which for the most part is difficult to penetrate. Yet even then, in a number of instances the space appeared to be open but in reality, Simeone’s men maintained sufficient coverage to have some control. With the ball-far winger often covering the gap directly ahead of it, as well as support from the ball-far central midfielder they managed to close out the space well in coordination with their previously-stated collective shifts. A moment where Atléti lose their defensive orientation and it’s an easy vertical pass to expose the half-space. Throughout the 90 minutes there were a couple of a moments when this coverage wasn’t executed well enough however and it was these moments when their defence lost its stability. Considering this, these momentary gaps would’ve been an important area for Pep’s side to open up, which they did on a few occasions but to no end product. In the instances they did manage to find these gaps open, it was either a bad individual action such as a pass in the first half or strong recovery from Atléti which lead to the play breaking down. With the winger stretching the play and occupying the full-back, it was often the role of the inverted Bernat or Lahm to expose these gaps. Both would make runs from deep through their respective half-spaces, looking to find passes into the gap between the Atlético full-back and centre-back. Just behind him would often be the ball-near central midfielder, looking to provide a supportive influence deeper and potentially use the space vacated by his full-back. Bayern’s switch which opened the half-space behind Saul. Midway through the first half, there was a moment where Bayern did manage to open the midfield after exposing the space behind Saul after switching from right to left. The ball circulation did go through the defensive line, as Lahm switched the ball to Alaba who proceeded to play it onto Bernat in the left half-space. Upon this, Saul had to quickly move out to recover the defensive access which was lost in the switch yet Bernat was faster and moved the ball onto Costa on the touchline. With Saul rushing up, he was now out of position and Thiago was able to shift across quickly and receive the ball in behind. Although the midfielder was unable to progress the attack further as a misplaced pass resulted in a turnover, this play definitely hinted at one of the holes in Atlético’s defence. It was one of the rarer moments in the game where Atlético’s shift wasn’t co-ordinated to a sufficient level but Bayern simply struggled to take advantage. Despite managing to open these gaps a few times throughout the game, they would’ve obviously wanted to do so on a more frequent basis but the deficiencies in their game made it difficult for this to be achieved. To begin with, their spacing issues with the ball was rather problematic as the midfield was often ill-equipped to expose these gaps. With weak connections and spatial distribution in the midfield, Bayern’s ball circulation was at an immediate disadvantage with passing across the block having a limited intensity. Yet when you’re looking to expose gaps on the other side of the pitch, one of the key mechanisms in doing so is fast switches of play. Because the likes of Alonso and Vidal didn’t understand how to position themselves accordingly, their ability to switch and open the half-space was immediately decreased. The lack of occupation in the centre made many of the wide possessions rather isolated with no way of moving the ball back inside through the midfield. The alternative therefore was to play the ball back through the defensive line to the opposite half-space which, with a longer distance being covered was a slower option. Similarly to what was described in the above paragraph, the switches were generally too slow to beat the intense ball-oriented shifts of Atlético. As the second half of the game developed, it seemed like Guardiola was looking to create better occupation of the central spaces in possession with a more aggressive positional structure. Alaba immediately began to take on higher positions and acted as a central midfielder when Bayern had the ball in the opposition half. Thiago and Vidal maintained their wider movements but were also commonly positioned in their respective half-spaces now too. Lahm joined Alaba in the centre more commonly and Bayern saw more of the ball in the centre of the pitch. They were still passing in front of Atlético’s strong defensive block for the most part but now they had the ball in more strategically-valuable than compared to the wing-oriented first half. From the centre, Bayern had better access to the rest of pitch and their ball circulation improved as a result. Going back to the Guardiola quote I mentioned above in the article, Bayern’s ability to play through the wings became more effective with the strong structure in the middle of the pitch. Now against a better-spaced side Atlético’s defence found it more difficult to maintain the levels of control they did in the first half. Their access lessened in the centre as Alaba and Lahm’s presence created a stronger presence for Bayern whilst their defence struggled to cope with individual dribbles as well as they had in the first half. Without the control, it was now a matter of protecting the penalty area which they did well as their defensive flexibility was on show with strong covering mechanisms to maintain security. With a 1-goal deficit for the second leg, progression into the final will now be a very difficult challenge for Guardiola and his Bavarian side. Although his side improved in the second half and played better than Barça had in the quarters, their attack was still blunted by the Atlético defence which held out well in the second half. Criticisms of Guardiola can be made with his side playing poorly throughout 2016 so far and his selection was definitely questionable for this game. Great work, good explanation why Guardiola only wanted to have one striker and possibly therefore dropped Müller. That was obviously because of his wide appraoch and winger focus. And also good explanation why that didn’t worked as expected. My question is, if it would have been better to start with a more centralized focus (Müller instead of Thiago) and then to introduce the winger focus ( Coman substituting Alonso) the last 30 Minutes, when Atletico is not anymore cabable of playing that high intensitiy pressing. I watched this game with lots of attention, because I knew that Atleti would cause a lot of problems to Bayern. I only saw the game once (live, on TV), but I want to watch it again. I saw many of the aspects you talked, but your explanation of these aspects was simply brilliant. I think that the high press and the full-back orientation of Atlético were the key-elements of this game. This game proved to me that some aspects that are “sure thing” in football are not so “sure thing”: for example, all coaches tell their full-backs to close inside, but the Atleti’s full-backs were not doing that, and they were excellent by being like that! Also, how many teams make a right full-back come to the inside in their build-up?? The tactic of Simeone, and the answer Guardiola tried to gave were awesome. Two great managers. I just think you could have explained the 2nd half in more detail. Vidal really tried to explore more the right half-space, and Thiago was not doing that so well – I think that and the fatigue were the reasons for his substitution by Muller. Also, the placement of Costa in the right flank was to responde to the full-back orientation. Even receiving facing more his own goal, Costa can dribble to inside zones and attract opposition players in 1vs1 or even 1vs2, leaving some players of Bayern alone. And having Guardiola said it or no (maybe the players felt that need), they tried more the shots from distance, but with no goal coming. I am really curious about the 2nd game! Utterly brilliant, thank you very much! Two questions: What do you think could be the reasons for Bayern’s recently weaker positional play, and do you think that this Atlético is superior to the 13/14 side?